As Residence Life, we commit to the creation of environments in alignment with the Institute's values by facilitating purposeful opportunities for residents to live, learn, work, and play. Such environments, and their activities, will motivate students to serve as Georgia Tech leaders in society. The student communities are served by 4 area offices with each specializing in either Freshman, Undergraduate or Graduated/Family housing. Residence Hall Association (RHA) offers the chance to make a difference on-campus. As an officer you will have the authority to allocate money, join committees, advocate on important issues, and grow as an individual. 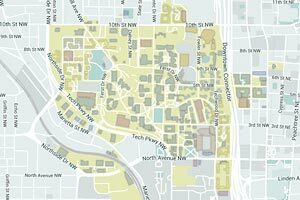 Undergraduate Apartments is the area where most of the on campus residents live. We are responsible for buildings located on both East and West campus. We house students from their 1st year to Graduate school in both Suite and Apartment style buildings. Our staff work hard to create environments where students can live safely and interact with other students. Graduate students have a unique lifestyle. We know that many of your days will be long-working on research until all hours of the night. We also know that some of you will need to adjust to a new town and a new institution. Our building is designed and our staff is trained to help you succeed. We have more study lounges than recreational areas and our activities help you acclimate to Metro Atlanta. About 70% of our residents are International so the experiences you have living with us will be more than even you can imagine. The graduate housing areas also have an extremely strong tradition of hall government. In 2001, respectively the Graduate Living Center Hall Council won the "Hall Council of the Year" from Tech's Residence Hall Association. This honor has been bestowed on a graduate hall council 3 times since 1993. Our residents are committed to enjoying their time at Tech, in between conferences, paper submissions, comps and qualifiers. We hope you consider joining our international community of scholars. The Staff and Community Development office is the unit of Residence Life responsible for the operations, processes and programs of Residence Life which enhance the experiences of student and professional staff and our residents. These areas include: Housing Student Conduct, Leadership and Advising, Assessment and Research, Training and Development, Staff Recruitment and Selection, as well as, Academic Initiatives. The Staff & Community Development Office believes in keeping students at the center of our work. We create learning-centered environments by providing consultation to residents and staff while fostering relationships and connections with campus partners.